BROOKLYN — Jessica Henson's family of four made do with their "one-plus" bedroom in Downtown Brooklyn for several years, but the open-lofted area where she and her husband slept was no longer workable with their 8-year-old and 6-year-old sons sleeping below. They showed their home on a Sunday last June. The next day they had three offers and were in the middle of a bidding war. The sale almost doubled what they paid for it in 2005. But Henson, an actress, wasn't so lucky in her own search. She found nothing worth buying that fit her criteria — a door on her bedroom and a second bathroom. So, she began searching for rentals. 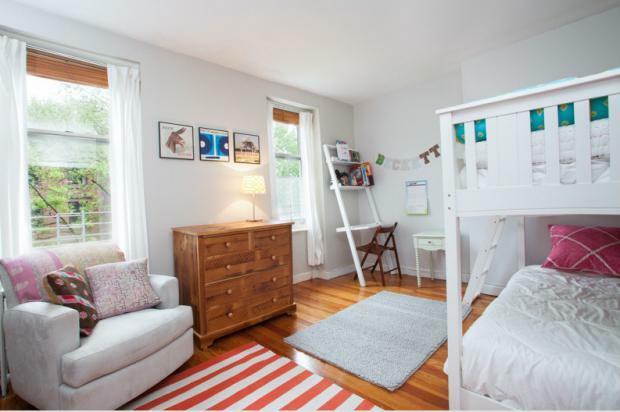 But everything in their price range — under $4,000 a month for a two-bedroom somewhere between Downtown Brooklyn and Red Hook to be close to their boys' school — had second bedrooms or living spaces that were too small. Renting versus buying is still a question on the minds of the many house-hunters enticed by historically low mortgage rates and egged on by record-high rental prices. But the issue may be moot for many, whether because of inventory constraints or tight credit. "In the last year and a half the generic brushstroke statement is, it’s generally cheaper to buy than rent," said real estate expert Jonathan Miller. "But that's only half the equation." Because of tight credit, many people won't qualify for mortgages, he said. Also, with many homeowners unable to become buyers themselves, they stay put, further constraining the market, he noted. Kings County saw its lowest inventory of homes for sale in the five years that Miller began keeping track for the quarterly market report he compiles for Douglas Elliman. The average sales price increased 12.3 percent to $634,594 and the average rental price rose 5 percent to $3,017 a month, according to Elliman's first-quarter market reports. As the closing on their home approached, Henson, 40, grew anxious. "I was tracking down foreclosures," she said. "We looked into teaming up with another family to split a house. I was leaving letters in people's mailboxes. I had ears on the street. "We were trying to get really creative. Things that may have been available and affordable to us a couple of years ago seemed to be slipping away." Just as her rental search was hitting a dead-end, a home in the Columbia Street Waterfront District that had been under contract came back on the market. Henson put in an offer within 48 hours. They moved in October, paying "substantially under $1 million" for the two-bedroom, which ended up costing less than they would have paid for a rental, she said. "We feel really lucky. We get briny breezes on a nice day. We have tons of light. We get to see the sky." Many brokers advise clients to buy if they'll be staying put for at least five years. But house hunters need stellar credit and the ability to win a bidding war, where cash has become king, brokers said. "Right now is a horrible time to be a buyer or a renter," said Catherine Witherwax, director of sales for the boutique firm Stribling's first Brooklyn office, which is set to open May 21 amid the high-end clothing shops and antique stores on Atlantic Avenue in Boerum Hill. "There's very little on the market," she said. "We're seeing unprecedented interest in Brooklyn and people staying in Brooklyn. And we're seeing a large international component. The borough's popularity goes beyond New York City and the metropolitan area." Witherwax said she's been seeing clients looking for "that five-year home instead of that perfect forever home" as they're outbid on multiple properties. "Renting might make sense if your career changes, if you're getting married or pregnant and might have different needs," Crystal Green, an agent with Rutenberg Realty, said. Buyers should also be aware of potential future expenses. For instance, there might be assessments for water issues or salary increases for doormen or a boiler in a townhouse that needs replacing, Green said. "As a purchaser you have to think of all these things that go up," Green said. "As a renter, you're not affected by those things." "Crown Heights is really starting to boom and get established," said Sarah Burke, who runs the Elliman office in Williamsburg. Buyers can find a well-maintained and renovated house in the $1.2 – $1.5 million range, which is comparable to prices for an unrenovated home in Williamsburg, she said. There's a 10- to 30-percent difference between Manhattan rentals and Crown Heights, Burke said. "You might be getting a studio in a building in Manhattan or go to Crown Heights and get a two-bedroom." Green also said that Crown Heights was becoming more popular for people trying to save money. "Studios cost $1,200 to $1,500," she said. "If you're coming from Manhattan, that's a big deal." With the low inventory in Williamsburg, many are looking to Bushwick, Burke said. "People are more and more willing to explore other neighborhoods," she said. "They're looking for convenience to wherever they're going — anything along the train line." Green moved from her apartment with a terrace in Clinton Hill two years ago to a garden-floor apartment in Bedford-Stuyvesant, following many of her clients. "I saved $700 by walking 10 blocks down and got a big private backyard," she said. "Yes, I'm off the G train. But the G to the E to Midtown is about 20 minutes." The gap between Manhattan prices and Brooklyn neighborhoods like Dumbo continues to shrink, brokers said. "Developers are underwriting between $1,200 and $1,500 a square foot depending on size, location and level of finish," Greg Williamson, a broker from Douglas Elliman, said of new condos going up in Dumbo. For rentals, the median price per square foot for a top-of-the-line apartment in Dumbo is $55. This compares to Windsor Terrace's median rental price of $30 per square foot and Bedford-Stuyvesant's median price that can be as low at $25 per square foot, Wittlecox said. For clients priced out of "Manhattan-like" Dumbo, many look next in what Williamson simply calls "expensive" areas, including Williamsburg, Carroll Gardens, Cobble Hill and Boerum Hill. His short list of "up-and-coming" areas includes Crown Heights, Bushwick, Prospect Lefferts Gardens, Ditmas Park and Kensington. "There's great value there," Williamson said. "Just like the borough as a whole, they will continue to appreciate. Those are wonderful communities and they're getting better and better." Up next: Midwood… or Queens? While most Manhattan brokers who also work in Brooklyn tend to focus on north Brooklyn and southwest Brooklyn, Green sold her first home in Midwood last year — a two-bedroom for $200,000. "Years ago, people moving to Brooklyn said I have to get to Manhattan in 10 minutes," Green said. While that's no longer the case, she wasn't sure the commute from Midwood would catch on. "It's still too far," she said. "It took me too long to Midtown." Queens might be the next alternative. "What you're seeing is that people priced out of Brooklyn are looking at Queens," Miller said. "Queens is going to be a big beneficiary of Brooklyn's success."